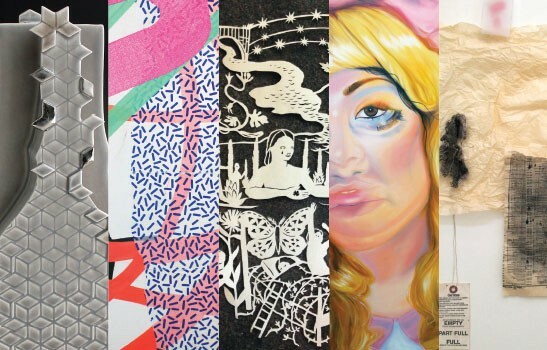 Opening this weekend at the Petaluma Arts Center, "Discovered: Emerging Visual Artists" exhibits the work of five diversely talented artists living and working in Sonoma County. Creative Sonoma, the county's arts outlet of the economic development board, presents the show as part of a program funded by the Artist Awards Endowment Fund of the Community Foundation Sonoma County. The purpose of the program is to focus on relatively unknown local artists to help propel them into the community's consciousness. This year's "Discovered" show includes the work of Santa Rosa artists Jenny Harp and Dayana Leon, Occidental's Catherine Sieck, Sonoma's Kala Stein and Petaluma's Jaynee Watson. Their pieces represent a wide range of styles. Harp makes colorful, mixed-media art that has been shown in downtown Santa Rosa; Leon creates hypnotizing paintings that explore identity in a society of physical enhancements; Sieck's cutout paper assemblages depict life in bygone eras that are as detailed as they are imaginative; Stein makes ceramics with innovative mold and casting techniques; and Watson's mixed-media installations defy explanation. This year's artists were selected from over 40 applications, and in addition to having their work shown, each artist receives a $2,000 stipend. "Discovered: Emerging Visual Artists" is on display through March 18, and opens with a reception on Saturday, Jan. 21, at the Petaluma Arts Center, 230 Lakeville St., Petaluma. Reception at 5pm. Regular hours are Tuesday through Saturday, 11am–5pm. 707.762.5600.